This month I’ve had five times more traffic than in any other month since I began blogging in Oct 2006, even during woblomo. Why? 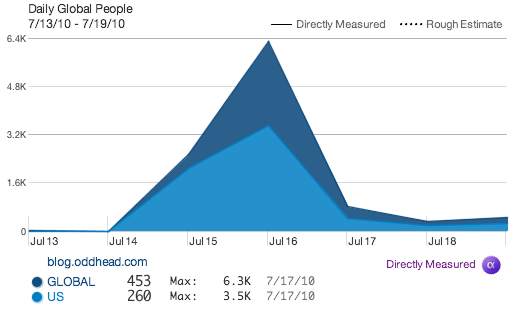 I paid Paul Graham a compliment that struck a minor viral nerve, spreading through twitter, facebook, and blogs and sending over six thousand people my way on July 16 alone according to quantcast. Of course most have since dispersed. Power on the web flows backward through referrals to the sites that people begin their day with, the sources of traffic. Referrals from social media, unpredictable and bursty though they may be, are inexorably on the rise. As they grow, power will shift away from search engines, today’s referral kings. Who knows, this may embolden publishers to take previously unthinkable steps like voluntary delisting, further eroding the value of search. This has all been said before, perhaps best by Mark Cuban starting in 2008. It would be a blow to openness and hurt users, but would spark a fascinating battle. Another meta note: I installed a new WordPress theme: Suffusion. It’s fantastic: endlessly configurable, bug free, fast, and well designed. I happened upon it by accident when WP 3.0 broke my old theme and I couldn’t be happier. Apparently written by a teenager, I donated to his beer, er, coffee fund. First: I did it! A perfect 16 out of 31. I completed the (ok, my) World Blogging Month challenge to blog every odd day in the month of March. Last year WoBloMo leapt out of the gates with five participants but I fell five hours short of the goal. As far as I know only Anthony and I returned for year two. He succeeded too according to official Australian Rules. Again, I found the exercise worthwhile, clearing a number of items out of my queue, albeit mostly the easy and inane ones (c.f. the barking), and boosting readership. In fact, I enjoyed it so much that I’ve signed up for World Blogging Year (WoBloYe). I will blog every odd day of every month at least through the end of 2010, starting today. In fact I have formally pledged to stickk to my goal. Moreover, I am putting my money where my mouth is, PM-style. For every odd day of the month that passes blog-post-free I will donate $100 to my anticharity, the re-election fund for Don McLeroy. If I miss two deadlines in a row, my antidonation will double. Three missed deadlines in a row and it will quadruple, etc. I’ve enlisted kibotzer’s help and you can follow my progress there. Wish me luck! P.S. In all seriousness, read that New York Times article about Don McLeroy. It’s one of the scariest articles I’ve read in a long time. It’s about how ultra conservatives on the Texas board of education are rewriting history and science according to biblical and republican dogma, and how standards in that enormous state can dictate what gets printed in textbooks nationwide. They’ve done things like add Newt Gingrich and delete Edward Kennedy as significant Americans. They’ve banned classic children’s books by Bill Martin Jr. because they confused him with a different Bill Martin, author of “Ethical Marxism”. It is the most crazy-making thing to sit there and watch a dentist and an insurance salesman rewrite curriculum standards in science and history. Last year, Don McLeroy believed he was smarter than the National Academy of Sciences, and he now believes he’s smarter than professors of American history. For the second time, a hacker (in the swine sense of the word) broke in and defaced Oddhead Blog. Once again, I’m left impressed by the ingenuity of web malefactors and entirely mystified as to their motivation. Last week several readers notified me that my rss feed on Google Reader was filled with spam (“Order Emsam No RxOrder Emsam Overnight DeliveryOrder… BuyBuy…”). The strange part was, the feed looked fine when accessed directly on my website or via Bloglines. Only when Google requested the feed did it become corrupted, thus mucking up my content inside Google Reader but not on my website. I’ve never seen a hack crop up with the tenacity of “remv.php” tho. Seriously, it’s kind of scary. I’m still not sure how or even if an attacker used remv.php to corrupt my feed in such a subtle way. I decided on surgery by chainsaw rather than scalpel. I exported all my content into a WordPress XML file, deleted my entire installation of WordPress, reinstalled WordPress, then imported my content back in. I restored my theme and re-entered some meta data, but I still have many ongoing repairs to do like importing my blogroll and other links. The attack was clever: a virus that sickens but does not kill the patient. The disease left my web site functioning perfectly well, making it less likely for me to notice and harder to track down. The bizarre symptom — corrupting the rss feed but only inside Google Reader — led Chris to wonder if the attacker knew I was a Yahoo! loyalist. That seems unlikely. I don’t think I have enemies who care that much. Also, the spammy feed appeared in Technorati as well. Almost surely I was the victim of an indiscriminate robot attack. Still, after searching around, I couldn’t find another example of exactly this form of RSS feed “selective corruption”: has anyone seen or heard of this attack or can find it? And can anyone explain why? I’m planning to take the World Blogging Month (WoBloMo) challenge in March. Join me! The goal is simple: blog at least every other day from March 1 to March 31. Post something — anything — on every odd day of the month and you win. Skip any day not divisible by 2 and you lose. Many bloggers already write every day or nearly so. More power to them. For the rest of us, who blog infrequently and spend copious time arguing with their inner editors, ludicrous and artificial pretenses can be a good thing. WoBloMo resembles the write-a-novel-in-a-month contest NaNoWriMo and other timed artistic challenges prefaced on the idea that quantity and quality can be friends. By suppressing the Spock-like perfectionist inside you, you can bring out your inner Kirk and “just do it”. Agonizing over details always has diminishing returns and sometimes, perversely, can make things worse. Or so the theory goes. You be the judge once (if) my WoBloMo fountain erupts. I joined the quantcast audience measurement service. It took about two minutes to sign up and initiate tracking. I’m impressed with the ease of use, the utility, and the inroads the company has made in the year or so since former Yahoo Mike Speiser first showed it to me. Looks like I’m getting about 1000 visitors a month, roughly 3/4 that of Chris, 1/6 of Robin, 1/10 of Lance, 0.00079% of my employer, and 0.00073% of my employer’s frenemy. Probably there’s some sort of business axiom here, probably already blogged and book-ed: the two minute rule of successful web services. Sorry folks, I just released 26 comments from purgatory where they had been sitting for as long as 58 days. All pending comments have now been approved and posted. I’ll try to go through them soon and respond where appropriate. About two months ago I changed my WordPress configuration and it turns out that comments were piling up for moderation without email notification, and I failed to spot the growing queue until now. Since I’m using re-captcha and have turned off trackbacks, I shouldn’t need to moderate comments going forward, so I’ve turned off moderation (fingers crossed). Here’s an update on my fractured relationship with The Economist magazine. To my pleasant surprise, Alan Press, Vice President of Marketing & Circulation at The Economist actually posted a comment on my blog agreeing to cease and desist their renewal scare tactics! We agree, the language is bad. We are discontinuing the use of this letter going forward, and will replace it with a message that makes clear how much we value readers like you. I thought this was a stand-up gesture. I temporarily felt all warm and fuzzy about the good old days when The Economist and I first met. In all seriousness, I do appreciate the public comment and the prompt/effective action. So are we getting back together? That’s none of your business! In any case, I’m happy to see blogplaining/freedbacking actually have an effect. I‘ve been blogging for about 33 weeks and this is my 31st post. Of those, I’d say roughly 12 are meals1 and 19 are snacks. So I’m clocking in a bit below one post per week, 1.5 meals per month. If you feel that’s too few, or if you have any other comments or recommendations let me know. I’ll see what I can do. Without satisfied readers I’m just a tree falling in the woods 0.94 times a week. In the meantime, if you’re craving more, you’re welcome to subscribe to the RSS feed of my shared bookmarks.2,3 There you can track me goofing off — er, conducting vital industry research. My bookmarking pace is closer to daily and I try to annotate each site with a revealing sentence or two. 1A meal requires some non-trivial amount of preparation on my part and digestion on yours. Hint: this post is not a meal. 2My shared bookmarks also appear in the two My Web Bookmarks widgets on the right hand column of this page. 3Christmas asks why I use My Web instead of del.icio.us. No good reason except that I started using My Web first and I’m happy with it. By now I’ve invested enough effort in My Web that I don’t care to switch. Someday My Web, del.icio.us, and Yahoo! Bookmarks should play nice. UPDATE 2009/02/04: I’ve now switched to delicious. 4Looks like there are two blogliners subscribed to my bookmarks and 44 subscribed to the Oddhead Blog main feed.